For you, life’s greatest role model is Mother Nature. You crave the organic, avoid the artificial and celebrate what’s real. Purity and vitality, beauty and serenity, light your fire and create a home that is earthy and elegant. You’re a natural for the Rustic Reflections lifestyle. Based in the arts and crafts movement, sophisticated Southwestern influences and mountain living, this style demonstrates true craftsmanship, simple design and the loving, organic combination of home, hearth and nature. Rustic Reflections captures the pure beauty and practicality of the outdoors yet creates a soothing indoor atmosphere of relaxed living, discriminating style and discerning furnishings. Topography dictates what architectural elements will be used to design and decorate your home, and colors take their cue from the adjacent landscape. This lifestyle incorporates natural materials to establish a serene indoor environment where the flooring, countertops, accessories and artwork collaborate to enhance what lies outside the windows. In many cases the fireplace, towering magnificently in stone, river rock or sandstone, is the room’s center of attraction. Furniture is authentic and hand hewn from hickory, oak, lodge pole pine, rattan and leather. Rustic Reflections also celebrates mismatched but thoughtfully collected furnishings and flea market finds; baskets, pottery, fine linens and antiques. 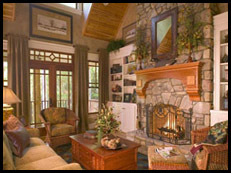 But while Rustic Reflections has variations, it’s always about bringing the outdoors in, and doing so effortlessly. Your Rustic Reflections home showcases slates and natural stones, heavily grained woods, hammered metals and natural fibers. Your colors are earth-toned: terra-cottas, rich browns, taupes and sage greens paint the indoor landscape. 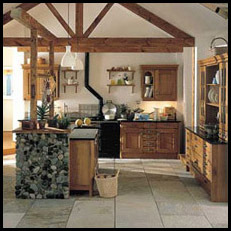 In your kitchen, rustic is the theme, with pine, hickory or maple cabinetry in the Shaker door style, with cut-from-the-earth granite countertops and tile in tumbled slate or limestone. 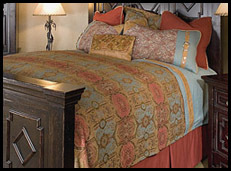 This is the Rustic Reflections lifestyle. Your way of living.